Today I am going to show how you can add a Facebook Popup widget for Blogger. This widget comes with Lightbox effect and looks attractive. The popup which appears is a one time popup i.e. the popup will just come one time and not in every page of your blog. The demo of this widget can be seen by clicking below button. Once you have seen the demo, below is the step on how you can add this Facebook Popup widget with lightbox effect to your blogger blog. After adding the code change AllBloggerTricks to your desired page URL. Save the Widget and after that Save the Template. Thats it, you are done now. 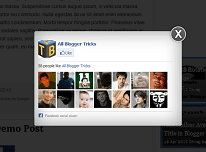 Now you and your visitors can see this Popup Facebook widget in your blog. hi i am really impressed with this facebook pop up box with light effects. could you please tell me how to make this box to show everytime on every page when i refresh the page. Hi ! Thats quite simple. Just remove the below given code and save the widget. After that the box will come everytime the page is refreshed. It can possibly be because of one reason i.e. your blog doesn't has Jquery plugin. To add it just add the below given piece of code at the top of the code which is given above in the post. You may have not added the Jquery plugin please check the comment which is just above yours. I have updated the code please check it out. Can I replaced facebook link with image? I want this pop up always show when refreshed only at HOME. Secondly add <b:if cond='data:blog.pageType == "index"'> at the beginning of the code and </b:if> at the ending. hi my dear friend i really like this fb pop up box .. to make this box to show everytime on every page when i refresh the page. Hi Dhiraj this code is not working on my blog what could be the reason.my blog is www.fresherscab.blogspot.in you can check it. Please help me my friend. I checked your blog and the widget was working properly. Its working absolutely fine. I would request you to check your blog again. hello and thank you for the code! i want to when people see the page, they need to click on 'like' botton to exit from the popup. i want to update this code in word press site then at which place i need to put this code? Hello Dhiraj Barnwal, I stumbled across your blog and I must say I am impressed because you take time to respond to your readers. Well done. I also need your help please. I have posted the widget and also included the Jquery plugin. Still, I am unable to see the FB pop up. Please help. What am I doing wrong. I will appreciate a quick response please. Apologies for reposting as I forgot to tick the notify button. Hi Dhiraj Barnwal, I stumbled across this very useful blog of yours as all attempts to include FB pop widget picked up from other sites hasn't worked. I must say I had hope because you took time to answer your readers questions and offered solutions. I also need your help please. What am' I doing wrong as I have pasted the widget plus the Jquery plugin and yet, I am unable to see the widget pop up. Dhiraj Barnwal, what am' I doing wrong? Many thanks for your anticipated assistance. Well I can see the popup without any problem. Have you tried opening your blog with another browser ? Thanks Dhiraj for your response. yes I have tried another browser. I can see the FB box without my FB details. Any other suggestions? I removed the code from my website COMPLETELY but it's still trying to load "fanclose.png" ?? But I want this pop up always show when refreshed only at HOME. Could you please explain what to do? Hello Friends, I would like to know how come That Works From The Cookie That From "expires: 7" In applying? are minutes, hours? I Want Every 1 Hour Have To Meet As appears?